Partition mapping is an innovative tool that contains various statistical functions to compare and map two different partitions. For example, two different techniques may subdivide the entries studied into groups (e.g. serotypes and sequence types) which may correspond to a certain degree. The partition mapping tool analyzes the correspondences between the two partitionings and produces a number of Mapping rules that define the significantly pairing groups between the two sets. 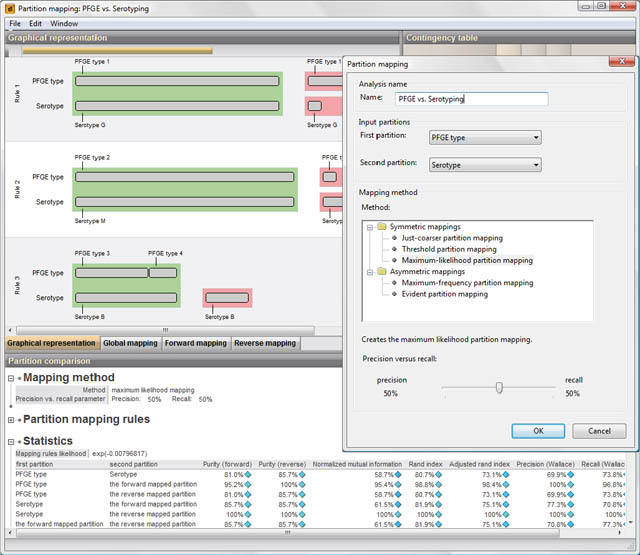 The partition mapping tool is very useful for analyzing the congruences and discrepancies between typing or classification techniques. It can be used to define reliable and consistent groups on the basis of multiple classification methods and to predict the groups of one technique based upon the results from another technique.